As a member of the board of my local chapter of the IABC (International Association of Business Communicators), I was involved in a conversation about should we be talking politics. We didn’t come to a conclusion. Since when are corporate leaders supposed to be our moral compasses? If no one else is willing to do it …? At least they aren’t (for the most part) shoving God down my throat. And our politicians are doing so well? There is a very thin line between my personal self and my business self – so thin that most people have a hard time finding it. However, in business-ish settings, I try to leave politics and religion outside of the conversation. The problem for me is that I tend to do business with people I like and who have similar opinions. Or, that I like and like to horrify with my opinions. That said, when it comes to my moral compass: I have one, IT IS VERY STRONG, and it is not based on God. I feel extremely fortunate that my parents raised my sister and me with the morality you’ll find in most religions without a religious bent. You don’t hurt, steal, or kill because those behaviors are not acceptable in our society – not because God is going to strike you down. I do believe that religion has its place. Yet, from my experience, the more vocally religious someone is the farther away from the actual teachings of their religion they are. Thus, the religious leaders that aim to be the moral compass of our society are not the ones I want anything to do with. One of those VERY STRONG points of my moral compass is the separation of Church and State. That means that there is absolutely no place for religion in the administration of our country. Similarly, there is absolutely no place for politics in my morality. As long as I’m not hurting, stealing, or killing, the government has no right to think they have a say in how I conduct myself. So, if my government isn’t allowed a say in my behavior (other than hurting, stealing, and killing), why should a corporation? Historically, corporations are not known for their good behavior. 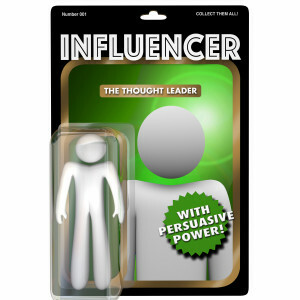 It’s Thought Leader Man! Is he faster than a speeding bullet? Can he jump tall buildings in a single bound? NO! But he can sway public opinion! And this brings me to a fundamental truth that makes many people uncomfortable: businesses stop killing, polluting, and doing other “bad” things when it becomes cheaper not to. Prime example, my first industry: mining. Mining companies stop killing people when the fines and lawsuits make it cheaper to implement effective safety measures. Similarly, mining companies stop polluting the air and water when the fines and lawsuits make it cheaper to implement cleaner processes. The panelists at the Corporate Social Responsibility event were the first to admit that giving back is good for their bottom line. The customer base cares more about how corporations behave – moving their business to companies who hold similar ideas as to what is right and wrong. And this, finally, brings me to my somewhat more considered response to the question of corporate leaders being moral compasses: they aren’t; we are theirs. They, however, have a much bigger voice. That voice gives them influence and the ability to spread the ideals of their customer base – because those ideals are the ones that make them money which makes them big corporations.